Army Rangers were a small, elite fighting force often referred to as “spearheaders” for being the first invasion forces on beaches during World War II. That was certainly true on D-Day, June 6, 1944, when the 2nd and 5th Ranger Battalions stormed ashore at Normandy. More than 150 World War II Rangers and family members will gather in Lawrence this week in celebration of their national reunion. The gathering includes Rangers from all six Ranger Battalions. There were 16 million Americans in uniform during World War II, and 8.3 million of them were in the Army. The original six Ranger Battalions totaled only 3,000 men; replacements raised that figure to about 7,000. The 5th Rangers were diverted to Omaha Beach on D-Day when Lt. Col. Max Schneider did not receive the code word to land at Pointe du Hoc. 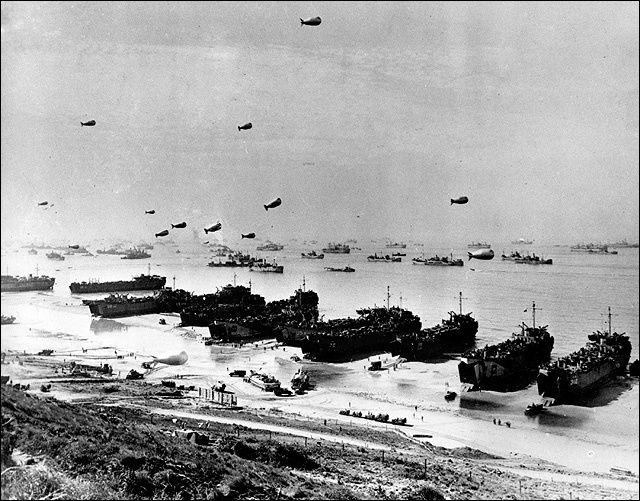 At that point, 2nd Rangers were to scale the cliffs and destroy the heavy German guns that could rake the entire length of Omaha Beach and annihilate the invasion force while it was still in the water. Schneider presumed – wrongly – that the 2nd Rangers had failed in their daring mission. Though still teenagers, 5th Battalion Ranger Pfcs. Bill Reed and Woody Dorman were responsible for using bangalore torpedoes to blow gaps in the wire the Germans had placed on Omaha Beach in expectation of an invasion. Both Reed and Dorman were transported across the English Channel by British ships. Reed admits to being scared, but he says the British gave him bacon and tomatoes for breakfast along with a rum ration. “I was scared, but I also had a bit of a buzz,” Reed said. 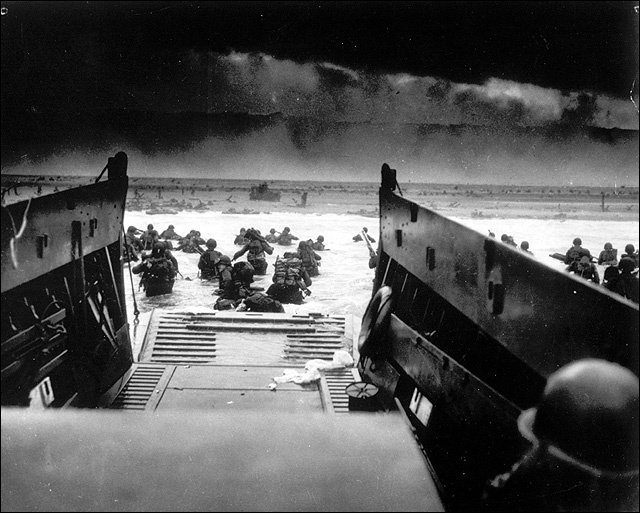 While under attack from German machine gunners, American soldiers wade ashore during the Allied landing operations on June 6, 1944, at Normandy, France. Burdened with three, 5-foot-long bangalore torpedoes strapped to their M-1 rifles, grenades, .45 pistols and bandoleers of ammunition, Reed and Dorman struggled through waist-deep water, which was quickly turning red from the blood of dying soldiers, to reach the beach and seawall. Through withering fire from mortars, machine guns and rifles, they vaulted over the seawall, planted their torpedoes under the wire and set them off, blowing a 20- to 30-foot gap in the wire through which soldiers could pass. Reed and Dorman were awarded Silver Stars for their heroics. “People were frozen on the beach,” Reed says, and the Rangers were ordered to clear everyone off the beach. It was then that the phrase that has become the Ranger motto – “Rangers, lead the way!” – was shouted by Gen. Norman Cota. Once through the wire, the Rangers made their way across a minefield and began the grim task of using grenades, rifles and bayonets to clear the enemy from strongholds and trenches. When the high ground and the Vierville exit to Pointe du Hoc was secured, the Omaha Beachhead was saved and the 5th Rangers began fighting their way toward the 2nd Rangers at Pointe du Hoc. The cliffs at Pointe du Hoc, towering in places more than 100 feet over the sea, made it unlikely that an attack would come from that direction and, unknown to the Rangers whose job it was to destroy them, the Germans had pulled back their heavy guns a half-mile inland. The landing crafts used rockets to propel steel grappling hooks attached to three-quarter-inch ropes to the top of the cliffs. However, the sea spray had made the ropes so heavy that some hooks fell short of the top. Rangers quickly climbed the ropes that held; the first Ranger took only 5 minutes to scale the wall, and most were up in 15 minutes. 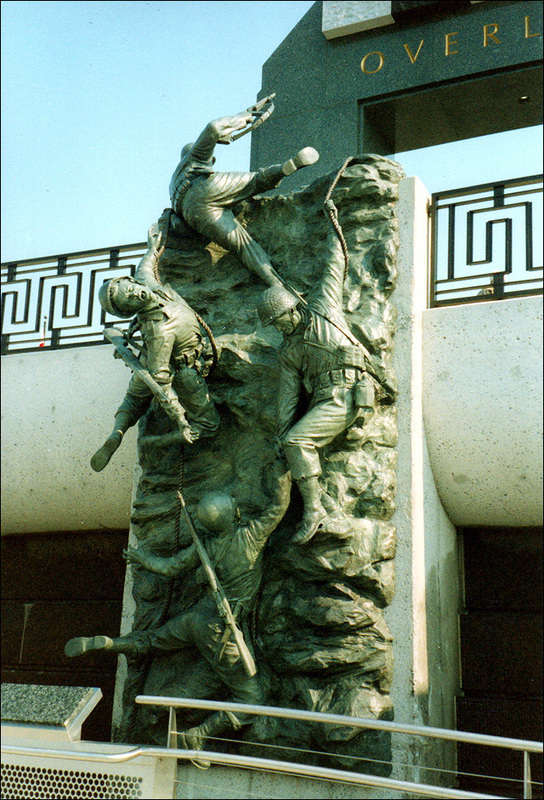 “Scaling the Wall,” a portion of local sculptor Jim Brothers’ National D-Day monument at Bedford, Va., depicts the 2nd Rangers’ amazing feat. Once the Germans at the top realized the Rangers were attempting to climb the cliffs, they began firing at them and cutting their ropes. Brothers’ sculpture shows one Ranger in the act of being shot. To achieve the realistic expression on the face of the Ranger at bullet’s impact, Brothers studied videotape of Lee Harvey Oswald – President Kennedy’s assassin – being shot by Jack Ruby. The expression is Oswald’s, but the face is not. Army Rangers who served in World War II and their families will meet at the Holiday Inn Holidome, 200 McDonald Drive, for a reunion Thursday though Saturday. They will be take part in a tour of the historic trail of Quantrill’s Raid; see a slide show of the D-Day monument in Bedford, Va., created by Lawrence artist Jim Brothers; take part in a memorial service at the Dole Institute of Politics; and have a banquet, among other events. Four DUKWs six-wheel drive amphibious trucks were equipped with the London Fire Department’s 25-meter power ladders with a machine gun mounted at the top. One DUKW sank, and the other two were unable to launch ladders. Staff Sgt. William Stivison’s ladder was functional, and when it was extended, he found himself at the top of a wildly swaying ladder. He was attached to the ladder with a fireman’s belt. According to one witness, Stivison’s ladder looked like a metronome, swinging to the right at a 45-degree angle and then back to the left at the same angle. As he reached the apex of the swaying ladder’s arc, Stivison fired the machine gun at German targets. When it became too difficult to tell whether he was firing on Germans or Americans, Stivison gave instructions to lower the ladder. This is the scene along a section of Omaha Beach in June 1944, during Operation Overlord, the code name for the Allied invasion at the Normandy coast in France during World War II. Stivison and other Rangers then found a big pile of dirt that gave them a head start on climbing the cliff. He was carrying a light machine gun; his buddy had the tripod, and others were carrying the ammunition. “I have no idea how I got to the top with that machine gun,” Stivison admits. The Rangers suffered extremely heavy casualties; a few were taken prisoner. At the end of the battle, only 50 Rangers of the original 200-plus were capable of fighting. But they accomplished their mission, and they never surrendered Pointe du Hoc. Reed, Dorman, Sundby, Stivison and Lomell are among the many Rangers who will be in Lawrence this week for a time of reminiscing about wartime experiences and remembering those who didn’t return home. Reuniting with his wartime buddies is of such importance to 92-year-old Leroy Button that he is making a 12-hour drive from Texas with his wife, a supply of oxygen and his nurse. The reunion is truly a gathering of heroes: Darby’s Rangers from the 1st, 3rd and 4th who fought German Gen. Erwin Rommel’s best in Africa and spearheaded the invasions of Sicily and Italy, only to meet disaster at Cisterna; Mucci’s 6th Rangers who launched the daring raid that rescued 512 survivors of the Bataan Death March at Cabanatuan prison camp; and the Rangers of D-Day, men of the 2nd and 5th Battalions who scaled the cliffs of Pointe du Hoc or landed on Omaha Beach and fought their way through France and into Germany until victory was won.